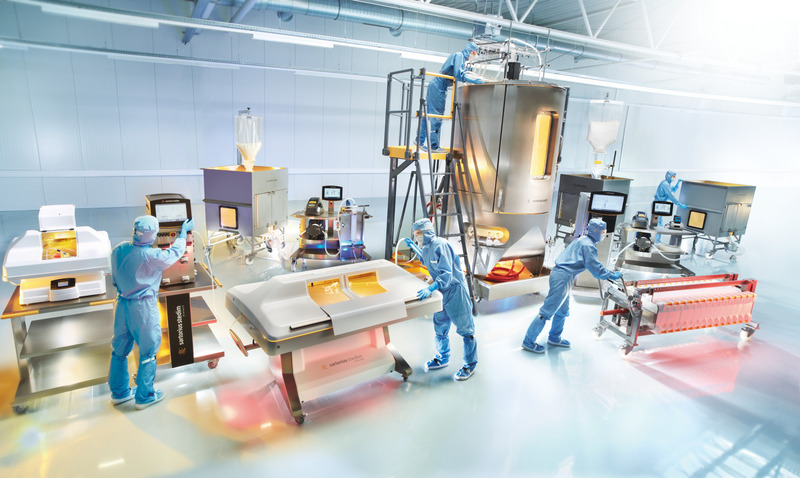 As the biopharmaceutical industry continues to grow at a rapid pace, companies are realizing that they may need to transform their biomanufacturing networks to respond to changing market dynamics and anticipate customer requirements. A major factor behind the growth of the biopharmaceutical industry has been the huge and continued success of the monoclonal antibodies segment. Within the industry, however, companies have started to diversify their pipelines, developing products such as antibody-drug conjugates, non-antibody recombinant proteins, gene therapies, and autologous and allogeneic cell therapies. With continued growth of the existing portfolio combined with the diversification of available therapeutics, biopharmaceutical companies are envisioning growth in existing as well as in various emerging markets. As a result, these companies are planning to increase their global reach by manufacturing products within the target market regions. Besides managing growth, product diversification, and footprint issues, the industry also needs to address four key imperatives: reduce costs, improve flexibility, shorten time to market, and increase quality/process robustness. Single-use and distributed scenarios are more likely if smaller product quantities are required. Stainless-steel and centralized scenarios are more likely if larger quantities are required. It is the authors’ opinion, however, that by switching to intensified fed-batch/perfusion processes, it is also possible to commercially produce high quantities of multiple biological drugs in state-of-the-art single-use/hybrid flexible and modular facilities at an acceptable cost of goods sold (COGS). And this would represent a very attractive model for the biomanufacturing facility of the future. This approach would present the best option for companies to initially design and build the facility at a lower cost, realizing a high-throughput, low-cost-per-gram process platform that can bring a product to market faster and, eventually, “scale out” in a flexible and modular way as the market diversifies and demand increases over time. For biopharmaceutical companies, advantageous manufacturing strategies may be determined during conceptual design (CD) if a process-centric approach is adopted. 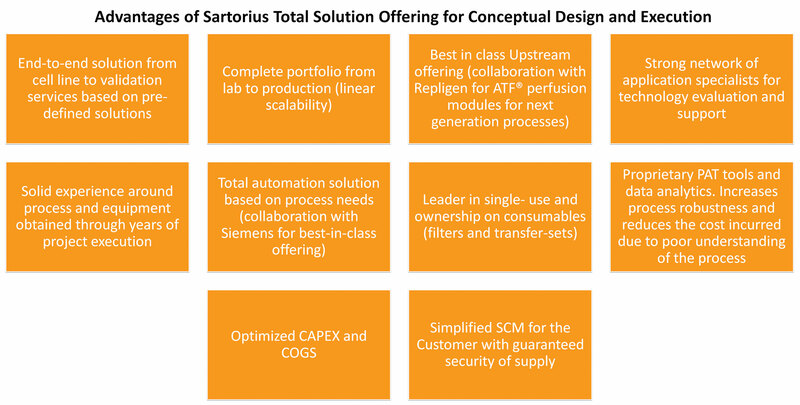 Such an approach is supported by the Sartorius P4S® (Process 4 Success®) platform, a detailed CD offering that helps companies optimize variables such as throughputs, process strategies (fed-batch, intensified), and technologies (single-use, hybrid). By using a process-centric approach, companies may build facilities that incorporate suitable technologies, follow effective manufacturing and automation strategies, and manifest risk-based classifications (closed, functionally closed, etc.). The companies may arrive at the best layouts (Figure 1) for meeting their throughput goals. In addition, a company could carry out process modeling using the BioPharm Services BioSolve® tool, for example. Doing so would allow the company to estimate the operational expenditures and COGS for the entire facility. Executing a CD project prior to making an investment decision would be extremely beneficial to a biopharmaceutical company. It would reduce uncertainties related to process, manufacturing, and automation strategies, as well as those related to market demand. It would also heighten a company’s confidence in its business case, including its product pricing strategy. At the start of a CD project, the Sartorius P4S tool may be used to define mass balance for a specific process or even a generic process. In a multiproduct scenario, mass balance helps companies select technologies and size equipment. It includes the relevant processing parameters for all process steps and defines the required volumes and processing times. During this exercise, the individual process steps are defined within all related unit operations and can be drawn directly into a process flow diagram. For the GMP room layout, the process and related requirements such as scheduling, media/buffer preparation, and distribution strategy are of central importance. The manufacturing suites will be designed around the process and not vice versa. An instructive case study concerns a 6 × 2 kL plant that employed different manufacturing scenarios, namely fed-batch (3 g/L), N-1 perfusion (6 g/L), and concentrated fed-batch (10 g/L). It was found that the maximum capacity was between 500 and 1800 kg/year depending on the scenario used. The related capital investment cost needed for the facility was in the region of €100 million ($115 million), and the annual costs were a fraction of those of a traditional stainless-steel facility, which were dominated by depreciation. The detailed design and realization of this kind of intensified facility require the adoption of certain processing units and technologies as there are existing limitations in single-use products and technologies in the market. These limitations, however, are minor and will no doubt be overcome by near-term advances that will enable full-scale intensified processing with single-use technologies. The design of such a facility can be highly flexible, enabling multiple products to be produced with short changeover times. In such a facility, it would be possible to implement 1) closed single-use technologies in upstream processes, and 2) single-use/hybrid technologies in downstream processes that are closed or can be made functionally closed. It could also prevent contamination of processes in cleanroom surroundings and processes further downstream, and even allow for ballroom/dance-floor operation for entire processes up to formulation. Designing unit operations in a modular way in these layouts further enhances process flexibility and minimizes changeover times by enabling the easy exchange of unit operation equipment or sequence. Project execution needs to be rethought based on process needs, single-use materials, and automation. Soon, there will be a need for companies to have consumables (bags, filters, and transfer sets) supplied in per-batch packages based on predefined solutions plus contingency packages that include the most critical consumables for the batch. To satisfy this need, companies will start simplifying supply chains, improving logistics, and minimizing warehouse footprints to accommodate the single-use processes. Today, the opposite is often the case. Besides rethinking project execution, the industry needs to rethink process automation, a task that must be based on digitalization, usability, scalability, and system access. The emphasis should be on bringing digitalization down to the field level by focusing on modular solutions with decentralized intelligence. This enables flexibility through the integration of intelligent package units and their respective process skids into a distributed control system (such as the Siemens Simatic PCS7®) and the overall automation landscape of the biomanufacturing facility. The process automation system is the focal point of the plant and must satisfy ISA S88 and GMP requirements for reporting, data management, user handling, auditing, and visualization. This approach will open the door for smart single-use bioproduction facilities that use electronic batch records, review-by-exception methodology, and multivariate data analytics tools (such as the Sartorius Umetrics® Suite, a data analytics platform) for real-time process monitoring, control, reporting, and release. The use of process analytical technology enables developers to build quality into the product and allows operators to track how the current process compares to an optimized process—this is known as golden batch analysis. The process automation concept can also be aligned with the facility automation concept using an ISA S95 architecture for the environmental monitoring system as well as the building monitoring system and some integration to commercial enterprise resource planning systems. Refer to Figure 2 for the ISA S95 structure that would be followed in these facilities. Figure 2. ISA S95 structure: four-level automation concept. 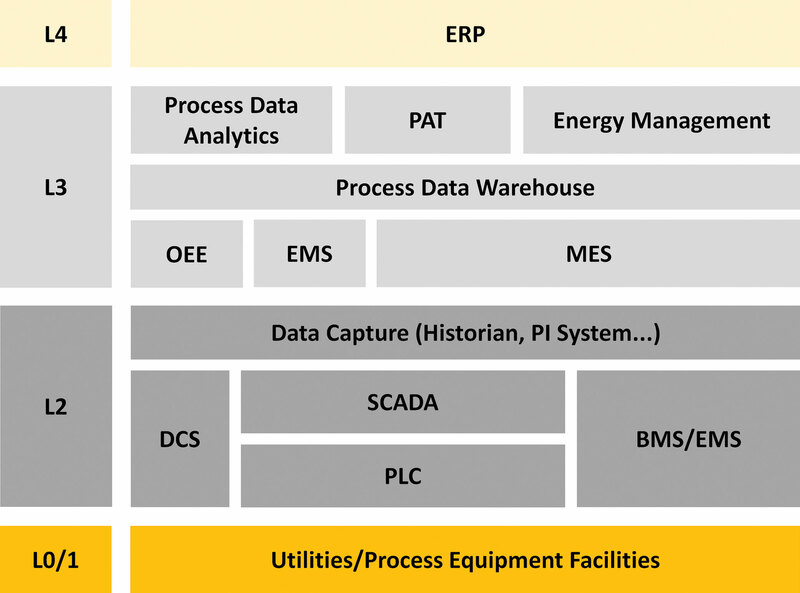 Abbreviations: BMS/EMS: building monitoring system/environmental monitoring system; DCS: distributed control system; ERP: enterprise resource planning; OEE: overall equipment effectiveness; PAT: process analytical technology; PI: process intelligence; PLC: programmable logic controller; SCADA: supervisory control and data acquisition. A customer that intends to carry out an overall conceptual design for a GMP facility should work with an end-to-end solution provider. Such a provider can ensure that the process part of the facility will respond to the customer’s needs. Besides benefiting from a total solution, one that is process-centric and encompasses technology and equipment, the customer may obtain an optimized single-use integration concept, a process layout, an overall automation strategy, a media/buffer distribution concept, and an overall process schedule for a high-throughput facility. Once these needs around the process are fulfilled, it is then recommended to transfer these results to an engineering company, which would then focus on developing the overall facility design, incorporating elements such as quality control labs, warehouse facilities, offices, HVAC (heating, ventilation, and air conditioning) systems, clean utilities, and black utilities. With this approach, companies would be able to get an overall solution (including equipment, consumables, and automation) at an optimized cost with total support and ownership of the project during the execution and follow-up phases. Also, an advantage would be to get tested and prequalified solutions that can be easily integrated into the facility and decrease the time required from concept to performance qualification considerably. Refer to Figure 3 for advantages of working with an end-to-end solution provider. Figure 3. Advantages of working with end-to-end solution providers. Abbreviations: CAPEX: capital expenditure; COGS: cost of goods sold; PAT: process analytical technology. Ganesh Kumar is a process consultant, Michael Koch is a sales director, and Gerben Zijlstra, Ph.D., is a platform marketing manager on the Integrated Solutions team at Sartorius Stedim Biotech.